I’m Ganga Jal, a Guernsey cow named after the holy water of the River Ganges. But my story doesn’t start in India—it begins in Wisconsin, USA. My mother, Goldie Goldstar, was born there on a dairy farm owned by the Proctor family. When the Proctors moved to Florida they brought my mom along. After some time in the South, however, the Proctors realized that they couldn’t keep Goldie anymore. Not wanting to sell her to a commercial dairy (knowing well what her eventual fate would be), they asked their vet if he knew anyone who would take her. Fortunately for my mom, this vet knew about Save the Cow at the Krishna farm in nearby Alachua. fair. So, string number one was that Jane could bring my mom the fair every year. String number two was that Goldie would be bred and if a female was born she too could go the county fair with Jane. Luckily for my mom (and for me), Save the Cow agreed to the proposal and Goldie Goldstar moved onto the farm. She was even given the Krishna name, Gauri (Sanskrit for Golden One), so she would fit into the herd. When fall arrived, Jane and the Proctors came and took my mom to the county fair. Unfortunately, Goldie had a bump on her back that marred her bovine beauty (at least in the eyes of the dairy cow judges) and, as a result, she never won any prizes for Jane. So all hope was put in the next generation—that’s where I come into the picture. My mother became pregnant by some strange method called AI (that’s artificial insemination, not artificial intelligence) and nine months later, on April 2, 2000, I was born (making me an Aires). Since cows can live to about twenty, a human year is about five cow years (as compared to dog years, which I understand have a 7:1 ratio). That makes my age about 40, in human years, that is. By the way, I am the youngest member of the Save the Cow herd. 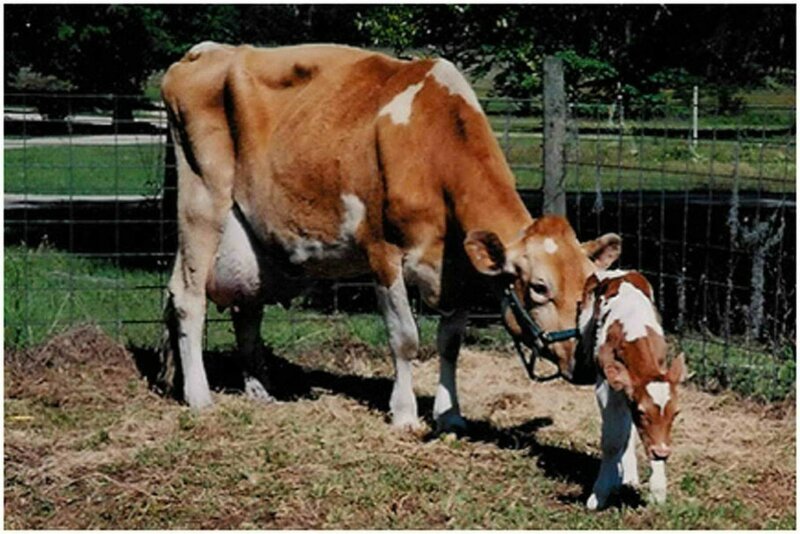 You see, and this may sound funny, Save the Cow is a Florida community for retired and rescued cows. But the history of Save the Cow is another story for another day.